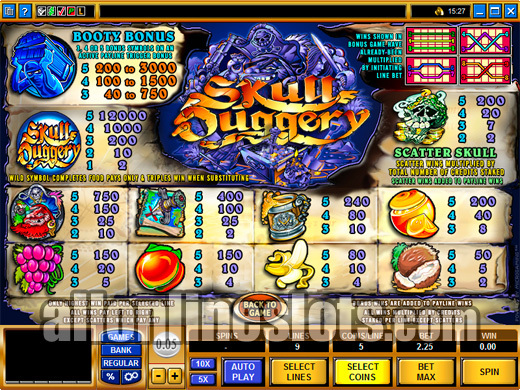 Skull Duggery is a pirate theme slot by Microgaming. It has a "Walk the Plank" bonus feature where you can win up to 3,000 coins. On the reels you have a top line win of 12,000 coins and the option to bet up to 5 coins per line. If you are a fan of the Big Kahuna video slot then you will really like this game. 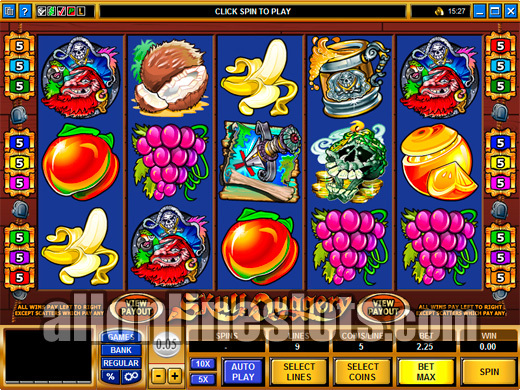 It is a pirate theme slot machine with 5 reels and 9 lines. To add to the excitement it also has a second screen bonus game where you always win additional coins to add to your bounty. This is a game for everyone as it has coins sizes from 1 cent right up to $1. You can bet up to 5 coins per line so the lowest max bet is really 45 cents. You could of course just play 1 coin per line which means you can play for 9 cents a game! On the other end of the spectrum you can bet up to $45 per spin. With 9 lines and 38 different winning combinations there are many ways to win on every spin. The Skull Duggery symbol is wild but only for the food symbols. In other words it only substitutes for the symbols of food, not the other symbols. The good news is that when you hit the wild symbol in a winning combo it triples your win. The top jackpot is won by hitting 5 of the wild symbols on any of the 9 lines. You will be paid 12,000 coins per coin bet on the winning line. So if you are playing the maximum 5 coins per line you will get 60,000 coins - a very nice win! As with most new 5 reel slots these days, Skull Duggery has a bonus game. To reach the bonus round you have to hit three or more grave robbers on a pay line aligned left to right. The amount you can win on the bonus game depends on how many of the symbols you start the feature with, 3 being the lowest and 5 the best. The actual bonus game is a very simple affair. 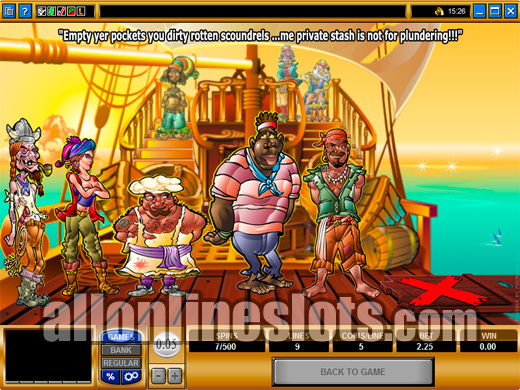 You get to select from one of several pirates, after you have selected your pirate they "Walk the Plank" and you are shown how many coins you have won. (View The Bonus Game). This can range from 40 to a big 3000 coins. Overall a fun new game with a very healthy top jackpot and coin sizes for every gambling budget. Have a spin for free or for real money today ..